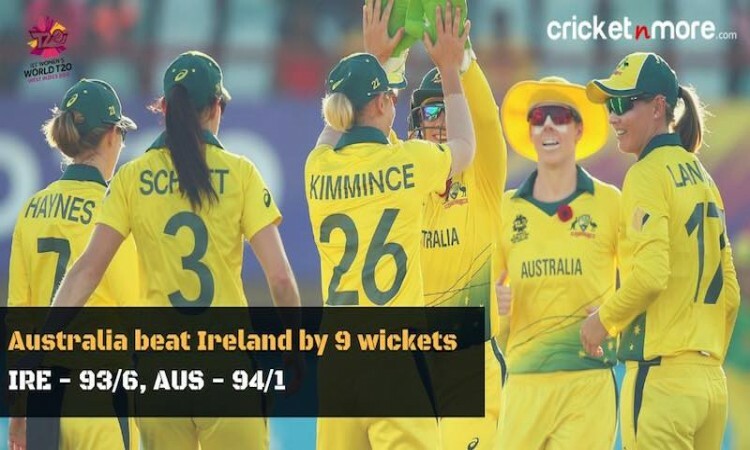 Nov.12 (CRICKETNMORE) - Australia beat Ireland by 9 wickets in ICC Women's World Twenty20 2018 on Sunday. Chasing Ireland’s 93 for six, Australia raced to their target in just over nine overs to secure a nine-wicket win. Most of the sprinting was done by Alyssa Healy, who hit the fastest half-century in the tournament’s history, reaching the mark off just 21 balls. She finished with 56 off 31, with nine fours and a six, also becoming the third wicketkeeper to score more than 1000 T20I runs. Earlier, Ireland had won the toss and batted, and had two major partnerships: 27 at the top and 41 for the sixth wicket, but precious little in between. After the opening stand, they lost five wickets for 16 runs, before captain Laura Delany (14 not out) and Kim Garth (24) gave them something to bowl at. But their batters were penalised once for running on the pitch, giving Australia a five run advantage in their chase. Before the game, Cricket Ireland congratulated Garth for playing 100 matches for her country across formats.